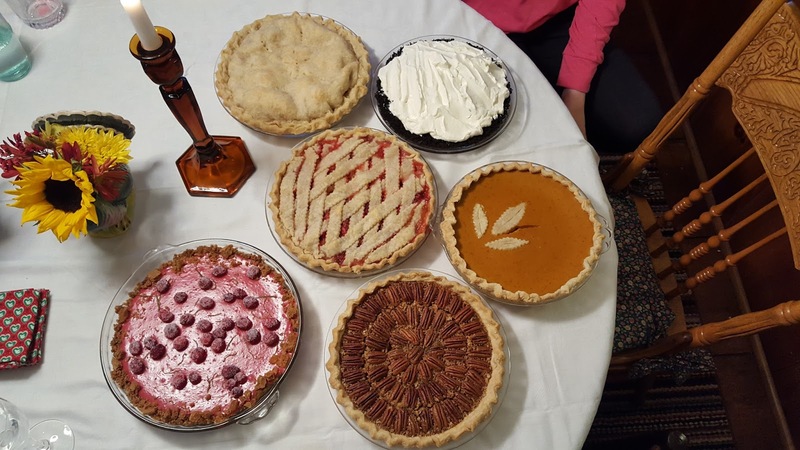 The Thanksgiving meal is really all about the pies. Forget about the turkey. Although Val does it so well, I have never felt the need to learn the fine art of a perfectly roasted bird. (I tell myself every year that I should really pick up some tips from the master.) Her turkeys always have the crispiest of skin, waiting to be peeled off and tossed into her mouth. "Do you want some?" she motions to the caramel colored 20 pound beast. This is the time you are actually allowed to rip some off for yourself. But you only have a minute...no lingering over this yearly treat. Eat your skin and get out of the kitchen. She shoos away everyone who has congregated around the pots and pans, handing someone a plate of appetizers to pass in the living room and keep everyone there-away from the kitchen. The carving is a precise, yet messy operation and her concentration on the gravy must not be interrupted. So, stay away until you are called. This is all so very important. But all I can think about is pie. There are "Oohs" and "Aaahs" over Val's buffet. Serving dishes overflowing with fragrant stuffing, creamed onions, homemade mashed potatoes, pureed squash from her garden, local turnip, bright, crisp green beans, warm, spicy cranberry sauce, corn for the kids topped with a melting pat of butter, rich, thick gravy and the bird, sliced, fanned out and ready for the serving fork. "Let's get on with it." I think to myself as I place a slice of white meat, a small spoonful of the crunchy edge of the stuffing, a taste of cranberry sauce and a nibble of corn. I'm NOT filling up on dinner. I am saving myself for pie. If you are an invited guest to this colossal, gourmet buffet, it is likely that you don't know what awaits in another room, not far from the kitchen. The pies are kept safely in Val's bedroom, away from drooling mouths. Their flaky crust must not get jostled, each one a work of art on its own and together, a collection of sweet delight. Every year, we talk about who will bring what to the Thanksgiving meal. My sister and I are usually assigned to side dishes and appetizers. Val says, "I will make the pies." It's a firm and non-negotiable statement. But no one would argue after one bite of the flakiest crust and those delectable fillings. 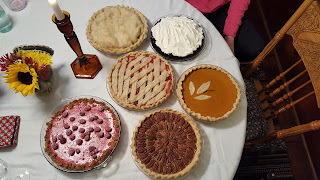 There is Classic Apple, Kentucky Bourbon, spiced Pumpkin, rich Chocolate Cream, Strawberry Rhubarb (2 of those) and Lemon Meringue (her mother's favorite). Mocha Macaroon and Coconut Cream have also made appearances through the years. By the way, only freshly baked pies will do. She gets up before dawn to bake off each one. She can tell the difference even though her guests likely cannot. But her opinion is the only one that matters here. She has set her personal pie bar high. So high that I dare not bring my own version of one of her recipes to our November banquet. Yes, I bake these specialties for others and on occasion, will bake something for Val, but never on this day. Thanksgiving is her time to shine. And I am ready to eat all the pies. Pie Crust, Classic Apple Pie, Kentucky Bourbon (a.k.a Uncle Don's Cowboy Pie) and Strawberry Rhubarb Pie can all be found by clicking the link(s) and under the recipes tab on this blog.